The event is held with the idea to promote and grow indigenous music, by the Buffalo City Metro together with SabaGroup of Companies. The event will see the like of Khuzani who’s hit songs include Ishende and Wavuma-Wavuma, Phuzikhemisi who is know for his hit songs like Bayede, Inja yam and Inkunzi kaBhejane. 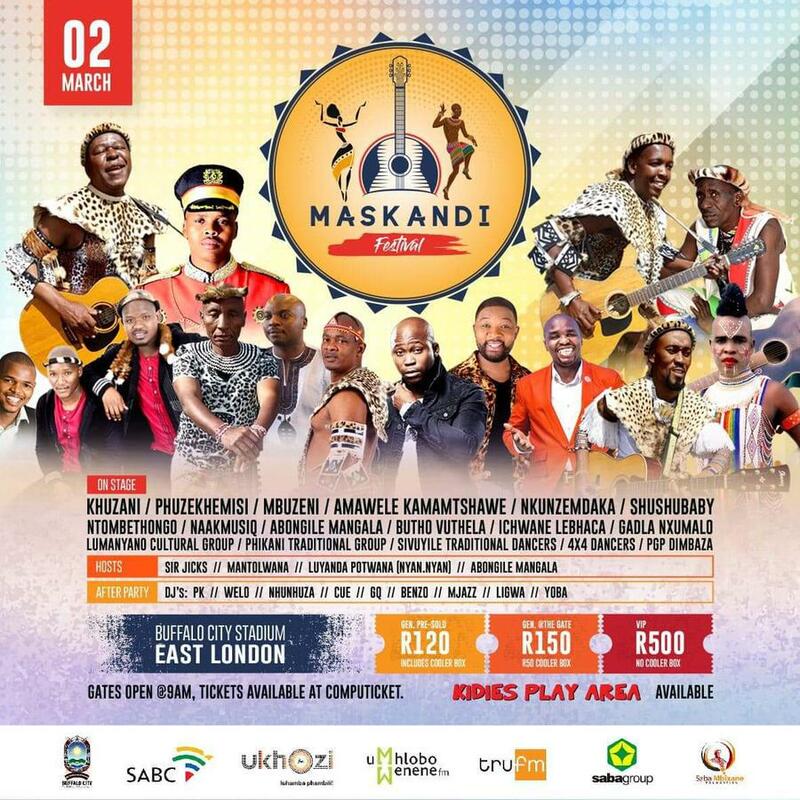 Another Maskandi group who will mesmerise the crowds include Amamwele kaMamtshawe with songs like Undishiya kanjani Featuring Zukelwa, Sagula, ShushuBaby and Maskandi legend Nkunzemdaka. Other artists include Ntombethongo, Mbuseni who’s songs include Wavuma, Intandane and Nginenkinga, Abongile Mangala, Gospel Singer Butho Vuthela, House musician NaakMusiq, Gadla Nxumalo. The show will also showcase the talented dancers from around the province which include Lumanyano Cultural Group, Phikani Traditional Group, Sivuyile Traditional Dancers, 4X4 Dancers and PGP Dimbaza. The hosts of the show include Sir Jicks of UWFM, Mantolwana, Luyanda Potwana of Nyan.Nyan and Abongile Mangala. DJs who will be showcasing their skills at the After Party include the likes of Welo, PK, Nhunhuza, Cue, GQ, Benzo, Mjazz, Ligwa and Yoba. Tickets are available at Computicket at R120 for early bird including a cooler box, general at the gate at R150 and R50 cooler box and VIP at R500 no cooler box. A kid’s play area is also available, gates open at 9am.